Dimensions and Prices are for the item shown. Please request quotation for similar item custom made to your dimensions. Most of our tables are finished with a hand rubbed natural penetrating oil that provides a durable long lasting finish. Table bases may also be painted to suit your decorating requirements. Cherry Wood Pilgrim Trestle Board Dining Table. This table is based on an early seventeenth century original that was pegged so it could be easily disassembled and put away when not in use. The table shown is also pegged for disassembly if moved. Finished with a hand rubbed, natural color, penetrating oil. 90" long by 33" wide by 29 1/2" high. 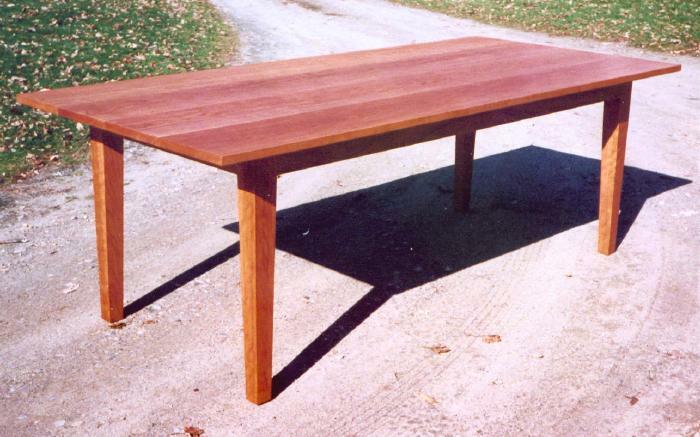 Cherry Dining Table with tapered leg. 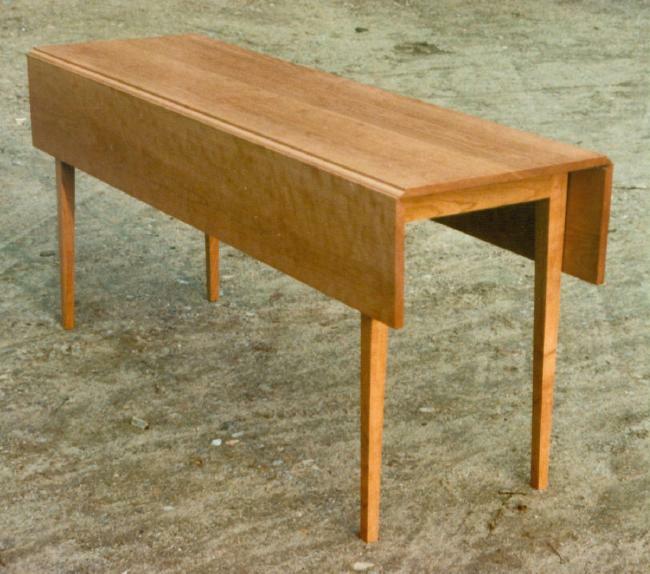 This simple but elegant table has a 1" thick top and a 3" square leg tapering to 2" square at the floor. Darkened slightly before applying a hand rubbed penetrating oil finish. 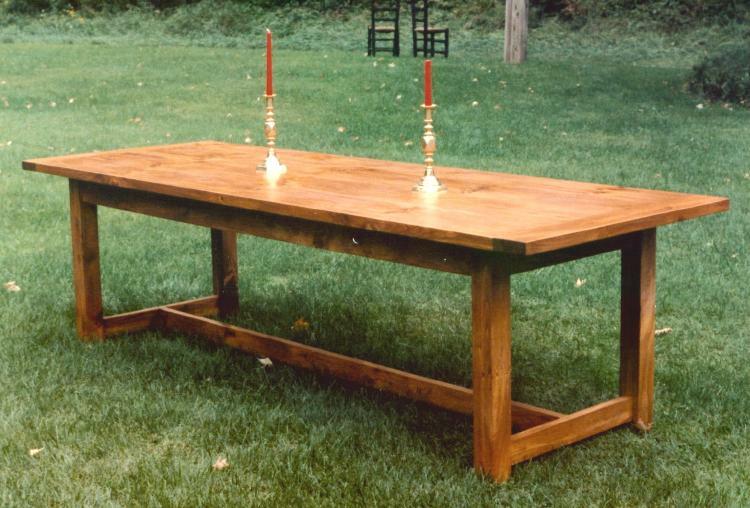 Country Pine Dining Table with square leg, H stretcher,and bread board end to the table top. 105" long by 36" wide by 30" high. Cherry Wood Shaker Style Drop Leaf Table also known as a Harvest table. This pretty little table is 72" long and only 17" wide with the leaves down. With both leaves up it is 37" wide. A wonderful table if you are limited for space in your dining area. Finished with a hand rubbed, natural color, penetrating oil. 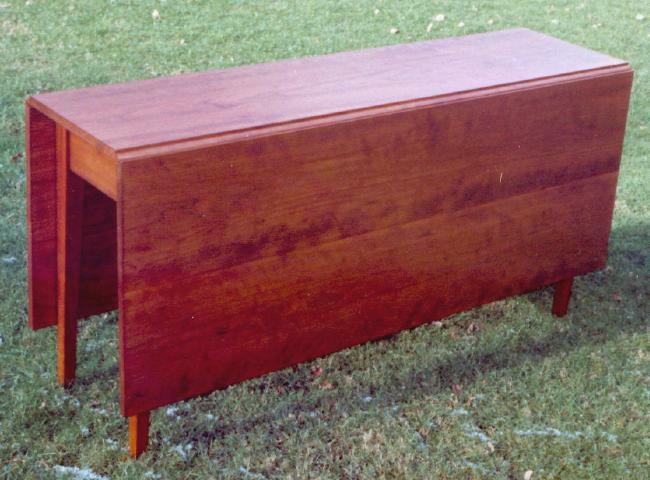 This extremely popular table has been made in a variety of sizes from 48" long by 44" wide to 78" long by 44" wide. 72" long by 17" wide (18 1/2" overall width with the leaves down) and 37"wide with the two 10" drop leaves up, by 30" high. English Jacobean Oak Trestle Table. This table has a classic heavy turned urn shaped leg and bread board ends on a thick table top. 72" long by 33" wide by 30" high. Cherry Wood Gate Leg Table. 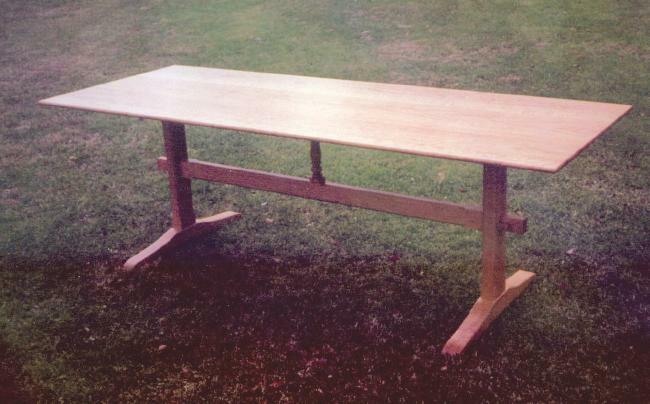 This beautiful little table was made as a copy to an antique American table that had been damaged. This table was darkened to give an old cherry appearance before applying a hand rubbed oil finish. 57" long by 14 1/2" wide by 29" high with two 21 1/4" leaves.